Tina Barr’s (Pot of Gold, Poetry) five volumes of poetry include Kaleidoscope (Iris Press, April 2015), The Gathering Eye (Tupelo Press Editor’s Prize), and three chapbooks, all winners of national chapbook competitions. Her fellowships include the National Endowment for the Arts, the Tennessee Arts Commission, The Pennsylvania Council on the Arts, The MacDowell Colony & Virginia Center for the Creative Arts. Journal publications include The Gettysburg Review, Shenandoah, New South, Witness, The Antioch Review, The Chattahoochee Review, Hotel Amerika and The Mississippi Review. Svetlana Beggs (The Love Note, Flash) is a Seattle-based poet and writer hailing from St. Petersburg, Russia. Her poems have appeared or are forthcoming in CALYX Journal, Natural Bridge, Hayden’s Ferry Review, New Orleans Review web features, Fogged Clarity, and elsewhere. Her fiction appears in Cleaver Magazine and Bartleby Snopes. Her short story “Alina” appears in Issue No. 10. Judy Bolton-Fasman (Not Even a Glass of Water, Creative Nonfiction) is an award-winning writer whose creative nonfiction has appeared on The Rumpus, Salon, Brevity, Cognoscenti, Lunch Ticket, the Rappahannock Review and 1966: A Journal of Creative Nonfiction. She lives and works outside of Boston. Born in Chicago, Maud Burnett McInerney (Hamlet Therapy, Creative Nonfiction) grew up in Stratford, Ontario, Canada, where she had the opportunity to see nearly all of Shakespeare’s plays by the time she was twenty (exceptions: Timon of Athens, Henry VIII ). She teaches medieval literature at Haverford College but spends as much time as she can in her house near Dijon, France. Miriam Carpenter (A Presence in Wood, Art) is an artist, researcher, and designer based in New Hope, Pennsylvania. After graduating from RISD in 2006, she designed furniture alongside Mira Nakashima for seven years. In 2014, she was awarded the Windgate ITE Residency sponsored by the Center for Art in Wood together with four wood artists from Japan, Canada, West Ghana, and the United States. The year following, she lived, worked, and studied with furniture makers, sculptors, scholars, and environmental stewards in Australia, Tasmania, and New Zealand. She is currently working as an independent artist while enjoying teaching across the country. Niyathi Chakrapani (Ode to the Quiet Room, Poetry) is a poet, neuroscientist, and computer scientist, in no particular order. Find her book, Thirteen Ways of Looking at the Stars, on Amazon, and her work in Veritas and Filament Magazine. Niyathi is a two-time winner of the Scholastic Art and Writing Awards National Silver Medal in Poetry and a poetry editor for Textploit Magazine. She is also a University of Pennsylvania freshman, mental health advocate, co-founder of Bridge: Freshman Mental Wellness, and a slightly rabid animal at the sight of chocolate. Yuan Changming (Aubade: A Parallel Poem, Poetry), eight-time Pushcart nominee and author of five chapbooks (including Kinship and The Origin of Letters ), is the most widely published Mandarin-speaking poet who writes in English. Growing up in a remote Chinese village, Yuan started to learn English at nineteen and published monographs on translation before moving to Canada. With a Ph.D. in English, Yuan currently edits Poetry Pacific with Allen Qing Yuan in Vancouver, and has poetry appearing in Best Canadian Poetry, BestNewPoemsOnline, Cincinnati Review, The Threepenny Review, and 1,089 other journals across 37 countries. Willie Davis (Last Words, Fiction), a native of Whitesburg, Kentucky, is the winner of the Willesden Herald International Short Story Prize and the Katherine Anne Porter Prize. His fiction has appeared in The Guardian, The Kenyon Review, storySouth, Hidden City Quarterly, and several other places. He is currently a fellow of the Kentucky Arts Council. Larry Eby (Spring Flight, Poetry) is the author of two books of poetry, Flight of August, winner of the 2014 Louise Bogan Award from Trio House Press, and Machinist in the Snow, ELJ Publications 2015. His work can be found in Forklift, Passages North, Fourteen Hills, Thrush Poetry Journal, and others. He is the editor-in-chief of Orange Monkey Publishing, a poetry press in California. His poem “Thundersnow” appears in Issue No. 12 of Cleaver. “Flight of August” appears in Issue No. 1. 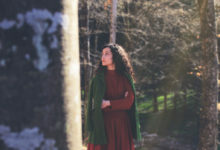 Odelia Fried (Prophet, Poetry) is a student, actor, and poet based in New York. Her written work can be seen in various literary magazines and her spoken word can be heard at UrbanWordNYC and at open mics across the city. She is interested in femininity, Judaism, and queer identity, and the intersections between the three. Aaron Graham (Gethsemane, Poetry) hails from Glenrock, Wyoming, population 1,159, which boasts seven bars, six churches, a single four-way stop sign, and no stoplights. His work explores the relationship of desire and violence through juxtaposing Iraq and Afghanistan war veterans with classical exilic figures. He is an alumnus of Squaw Valley Writers Workshop and the Ashbery Home School. He is a veteran of the wars in Afghanistan and Iraq, where he served with Marine Corps Intelligence as an Arabic linguist. Aaron is currently finishing his Ph.D. at Emory University, specializing in modernist poetics, Arabic language poetry, continental philosophy, and cognitive neuroscience. Carmella de los Angeles Guiol (Night Owl, Creative Nonfiction) hangs her hula hoop in South Florida. Her creative work has appeared or is forthcoming in The Toast, The Normal School, Lunch Ticket, Spry, The Fourth River, and The Inquisitive Eater. You can often find her working in the garden or kayaking the Hillsborough River, but you can always find her writing at www.therestlesswriter.com. This is Kristen Herbert’s (Mouettes, Fiction) first publication. She lives in Chicago, where she works as a barista by day and writer by night. She’s traveled some and lived in France for a while, which she likes to include in her works. She is very excited to be a part of this issue of Cleaver Magazine. Eric E. Hyett (Notes on Poem For My Brother, Poetry) is a poet, linguist, and translator from Cambridge, Massachusetts. His poetry, as well as his co-translations of contemporary Japanese poet Kiriu Minashita, appear frequently in major literary journals. Recent publications include The Cincinnati Review, The Hudson Review, Barrow Street, Borderlands: Texas Poetry Review, and Antioch Review. Eric is presently finishing two poetry manuscripts (“Flight Risk” and “#Sexting”), a memoir, and Minashita’s first book of poetry, Sonic Peace. Michael Kern (The Gas Station by Edward Hopper, Poetry) lives and writes in Washington, DC. He enjoys cooking, riding his bike everywhere, watching baseball, drinking good beer, making people laugh at his enthusiasm for Slurpees, and frustrating his friends by always being punctual. His work has previously appeared in Tidal Basin Review, Words Apart, and Blast Furnace. His poem “The Current Was Weak” appears in Issue No. 11 of Cleaver. Erika Dane Kielsgard (The Scorpion, Poetry) is an emerging artist who received her B.A. in psychology from George Mason University, where she wrote her award-winning research proposal, “Poetry and Journaling Therapy in PTSD” (2013). Her art was selected for exhibit in Fall for the Book’s “Call and Response” (2013, 2014). In her free time, Erika sings and raises arthropods. Her poetry has appeared in Rust + Moth (Autumn 2015) and is forthcoming in Bone Bouquet (Spring 2016, Issue 7.1). Tyler Kline (Cockcrow, Poetry) is the author of the forthcoming chapbook As Men Do Around Knives (ELJ Publications, 2016). His recent work is forthcoming in BOAAT, the minnesota review, Spoon River Poetry Review, THRUSH, Tinderbox Poetry Journal, and Whiskey Island. He is a senior at the University of Delaware and the current Poet Laureate of Bucks County, Pennsylvania. Find him online at tylerklinepoetry.com. Rebecca Lee (Mouse Meat, Flash) currently lives in Charlottesville, Virginia. She has been published in Existere Journal, Rusty Nail, The Noctua Review, and others. Read more at her website. Karen Levy (Bounty Hunting, Flash) is a writer and storyteller who lives and performs her work in New York City and Santo Domingo, DR. Her short stories have been published in Network Magazine, Icarus Down, and Brilliant Flash Fiction. She is currently seeking representation for her novel, The Story You Choose to Tell, set in the Dominican Republic. Bryanna Licciardi (The Baby Train, Creative Nonfiction) has an M.F.A. in poetry from Emerson College, an overweight yet incredibly agile cat, and a passion for humiliating herself for the sake of an audience. She is currently a doctoral candidate, studying literacy and reading disabilities. Visit bryannalicciardi.com to read about her past and forthcoming publications. Lyn Lifshin (The Affair, Poetry) has published over 130 books and chapbooks including three from Black Sparrow Press: Cold Comfort, Before It’s Light, and Another Woman Who Looks Like Me. NYQ Books published A Girl Goes into The Woods. Also just out: For the Roses, poems after Joni Mitchell, and Hitchcock Hotel from Danse Macabre, Secretariat: The Red Freak, The Miracle, Femme Eterna, and Moving Through Stained Glass: the Maple Poems. Forthcoming: Degas Little Dancer. Her poem “But Instead Has Gone Into the Wood” appears in Issue No. 10 of Cleaver. Kelly McQuain’s (The Empathy Machine Part Two, Visual Narrative) chapbook, Velvet Rodeo, won Bloom magazine’s poetry prize. He was a 2015 Fellow at the Lambda Writers Retreat for Emerging LGBTQ Voices and a 2015 Tennessee Williams Scholar at the Sewanee Writers’ Conference. McQuain has published poetry and prose in Painted Bride Quarterly, Redivider, The Philadelphia Inquirer, A&U, The Pinch, and Weave. He has served as a contributing editor to Art & Understanding and The Harrington Gay Men’s Fiction Quarterly, and his poetry and prose have appeared in numerous anthologies: Between: New Gay Poetry, Drawn to Marvel: Poems from the Comic Books, The Queer South, Rabbit Ears: TV Poems, and Best American Erotica. He has worked as a pretzel maker, a comic book artist, and a professor of English. He hosts Poetdelphia, a literary salon in the City of Brotherly Love. His poem “Jam” appears in Issue No. 1 of ’. Read more at his website. Michael Melgaard (When Things Wear Away Other Things, Fiction) is a freelance writer and an editor at an independently owned Canadian publishing house. He has contributed to several print and online publications, including Potluck Magazine, The Torontoist, and the Maple Tree Literary Supplement. He lives in Toronto. Emanuel Melo (Tiago, Fiction) was born in the Azores and immigrated to Canada at the age of nine. He lives in Toronto. His short stories have been included in Cleaver, Writers of the Portuguese Diaspora in the United States and Canada: An Anthology, and MEMÓRIA: An Anthology of Portuguese Canadian Writers. His articles have appeared in Mundo Açoriano, (TWAS) Toronto World Arts Scene, and on the website of the Canadian Centre for Azorean Research and Studies. His short story “Avó Lives Alone” was a finalist in the Writers’ Union of Canada’s 20th Annual Short Prose Competition for Developing Writers in 2013. 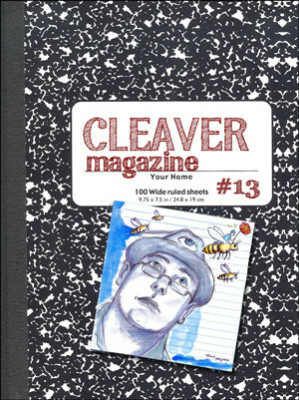 His short story “The Weekly Visit” appears in Cleaver Issue No. 8. Read more at his website. Addison Oliver (Yesterday and Today, Flash) is the pseudonym of a writer who lives with her family in Massachusetts. Joe Nicholas, AKA Dirty 4 String Orchestra, (from The Beauty of Admission, Poetry) is an amorphous blob. Their work can be found or is forthcoming in alien mouth, BOAAT, Found Poetry Review, Queen Mob’s Tea House, The Nervous Breakdown, and other wonderful publications. Their chapbook Street Monk can be found at Bottlecap Press. They can be found at 8rainCh1ld.tk. Tahneer Oksman (How Come Boys Get to Keep Their Noses?, Interview) is the Graphic Narrative Reviews Editor for Cleaver Magazine. She is an assistant professor of writing and director of the academic writing program at Marymount Manhattan College, and she recently published her first book, “How Come Boys Get to Keep Their Noses?”: Women and Jewish American Identity in Contemporary Graphic Memoirs. Ranen Omer-Sherman (How Come Boys Get to Keep Their Noses?, Interview) is JHFE Endowed Chair in Judaic Studies at the University of Louisville and the author of three books and the co-editor of two, including Diaspora and Zionism in Jewish American Literature, Israel in Exile: Jewish Writing and the Desert, Imagining the Kibbutz: Visions of Utopia in Literature & Film, The Jewish Graphic Novel: Critical Approaches, and Narratives of Dissent: War in Contemporary Israeli Arts and Culture. He has also contributed numerous journal essays and book chapters to major publications. Anne Panning (Blue: Smoke: Cotton: Teeth: Cat: Jelly: Blow, Flash) has published a novel, Butter, as well as a short story collection, Super America, which won the Flannery O’Connor Award and was a New York Times Editors’ Choice. She has also published short work in places such as Bellingham Review, Prairie Schooner, New Letters, The Florida Review, Passages North, Black Warrior Review, The Greensboro Review, Alaska Quarterly Review, Kalliope, Quarterly West, The Kenyon Review, The Laurel Review, Five Points, River Teeth, Cimarron Review, West Branch, and Brevity (4x). Four of her essays have received notable citations in The Best American Essays series. She teaches creative writing at SUNY-Brockport. Lisa Piazza (Everyone Means So Well, Flash) teaches writing to young people in the San Francisco Bay Area. Her work appears in Brain, Child, Cicada, YARN, Switchback, Prime Number, and Literary Mama, among others. Her flash piece “Look Here” appears in Issue No. 4 of Cleaver. She is currently at work on a young adult graphic novel-in-verse. Read more at her website. Maria Pinto (Granny and the Bonehead Squad, Fiction) was born in Jamaica and grew up in south Florida. Her recent work has appeared or will appear in Word Riot, Bartleby Snopes, The Butter, Pinball, The Missing Slate, FLAPPERHOUSE, Small Po[r]tions, 100 Word Story, and Literary Orphans, among others. She was the 2010 Ivan Gold Fellow at the Writers’ Room of Boston, in the city where she lives and does karaoke. Her debut novel is in search of a home. She’s working on the next. Fiction by Christopher David Rosales (Nobody Played the Guitar in the Corner of the Room, Flash) has appeared in anthologies and journals in the U.S. and abroad. This year Mixer Publishing released his first novel, Silence the Bird, Silence the Keeper, which won the McNamara Creative Arts Grant in 2009. He won the Center of the American West’s award for writing from 2008 to 2010. Rosales is the fiction editor for SpringGun Press and is a Ph.D. candidate at the University of Denver. His second novel, Gods on the Lam, is forthcoming in 2016 from Perpetual Motion Machine Publishing. You can reach him at www.christopherrosales.com and @CDRosales. Michelle Ross’s (Lessons, Flash) writing has won prizes from Gulf Coast, Main Street Rag, and Sixfold, and has been twice nominated for the 2017 Pushcart Prize. Her work has recently appeared or is forthcoming in The Adroit Journal, Arroyo Literary Review, The Common, cream city review, Necessary Fiction, SmokeLong Quarterly, Synaesthesia Magazine, Word Riot, and other journals. She is fiction editor of Atticus Review. Meggie Royer (Sugar, Poetry) is a writer and photographer from the Midwest who is currently majoring in Psychology at Macalester College. Her poems have previously appeared in Words Dance Magazine, The Harpoon Review, Melancholy Hyperbole, and more. She has won national medals for her poetry and a writing portfolio in the Scholastic Art and Writing Awards, and was the Macalester Honorable Mention recipient of the 2015 Academy of American Poets Student Poetry Prize. Read more at her website. Thaddeus Rutkowski (Emu on the Loose, Flash) is the author of the books Violent Outbursts, Haywire, Tetched, and Roughhouse. Haywire won the Members’ Choice Award, given by the Asian American Writers Workshop. He teaches at Medgar Evers College and the Writer’s Voice of the West Side YMCA in New York. He received a fiction fellowship from the New York Foundation for the Arts. Poetry by Mark Schoenknecht (Vaseline Sandwiches, Poetry) has appeared in 2River View, The Pedestal Magazine, Driftwood Press, and elsewhere. In 2013, Mark was awarded the David A. Kennedy Prize for his collection Kissing the Girl Who Wore a Mustache. He currently lives in Chicago, where he’s pursuing a Ph.D. in English. Lynne Sharon Schwartz (Miss Darlene’s Dancing School, Poetry) is the author of eight novels, including Leaving Brooklyn (nominated for a PEN/Faulkner Award), Rough Strife (nominated for a National Book Award), Disturbances in the Field, and Two-Part Inventions. She is also the author of several collections of essays, stories, and poetry, and translations from Italian. She teaches at the Bennington Writing Seminars. Andrew Taw (Study, Poetry) was born and raised in Northern California. He attended UC Davis for his undergraduate degree and Saint Mary’s College for his M.F.A. He currently manages the academic component of an educational nonprofit for high school students. Paul Tran (Heirloom, Poetry) is a Vietnamese-American historian and poet. He has won “Best Poet” and “Pushing the Art Forward” at the National College Poetry Slam, as well as fellowships from Kundiman, VONA, Poets House, Lambda Literary, the Napa Valley Writers Conference, the Home School, and the Andrew W. Mellon Foundation. His work appears in Prairie Schooner, The Cortland Review, Split This Rock, and RHINO, which awarded him a 2015 Editor’s Prize. Paul currently lives in NYC, where he is a Graduate Scholar in the Archives at the NYU Asian/Pacific/American Institute and coaches the Barnard College and Columbia University slam team. Smriti Verma (News Delivery, Poetry) has published poems and fiction in Word Riot, Open Road Review, DoveTales Literary Journal, Canvas, Textploit, and Yellow Chair Review. Further work is forthcoming in Alexandria Quarterly, Inklette, and Eunoia Review. She is the recipient of the Save The Earth Poetry Prize 2015 and enjoys working as a poetry reader for Inklette and editorial intern for The Blueshift Journal. Timothy Wenzell (May Procession Practice, Poetry) is an associate professor in the Department of Languages and Literature at Virginia Union University in Richmond, VA. He is widely published, including a novel, Absent Children, a book on Irish ecocriticism, Emerald Green: An Ecocritical Study of Irish Literature, and many short stories, poems, and scholarly articles in literary and peer-reviewed journals. Tim grew up and attended Catholic school in the Philly suburbs, and Philadelphia and the Catholic school experience have become sources for his fiction and poetry.